If your looking for your fences to add a bit more of a feature to your garden or landscaping project, then we do a range of Decorative fence panels, each one a little but different to suit any style of garden. All our panels are made from a pressure treated timber to protect the wood from rot decay and ensure use for years to come. Whether its to mark your boundaries or create a screen within an area, our choice of full size panels will definately create a focus point. If you're looking for something a little more traditional, but not so tall we also have a range of picket fencing - perfect to create a feature without blocking out any natural light. If you're still not sure from the choice we have below which decorative panel is best suited to your project, then all our branches have them on display for you to view. The Elite Melior Wooden Garden Fence Panel is an attractive decorative garden fence made from specially selected softwood. The timber on the horizontal slats and domed lattice top are planed, rounded and grooved, then fixed into a strong rebated frame 4cm deep. 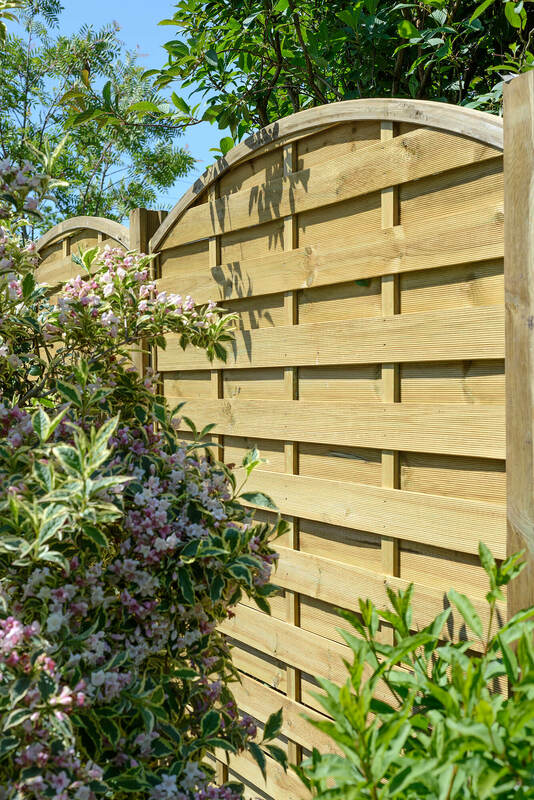 The Elite St Esprit Wooden Fence Panel offers a simplistic yet highly decorative design of Timber Garden Fencing Panel whilst maintaining high levels of privacy. The sturdy horizontal slats are planed and grooved then secured into a strong fully rebated frame. This Elite St Carne Dome Wooden Fence Panel is made from pressure treated and planed timber. The sturdy planed slats are secured in a rebated frame to create an elegant yet practical variety of timber garden fence panel. The Elite St Malo contemporary garden fence panel is an attractive timber panel with horizontal slats and a Lattice top which complements the superb planed and grooved timber finish. This traditional Round Top Palisade fence Panel is ideal for constructing a new fence or repairing an existing one. Built from vertical timber pales laid on slender planks of wood, the Palisade Garden Fencing Panel is strong enough to stay upright and secure in your garden for years to come. The Elite Profiled Picket Fencing Panel sets a new standard for premium quality timber garden picket fencing - providing a tailored, sophisticated look for a classic design. Use this wooden picket fence panel to mark out boundaries and perimeters in either a front or back garden.